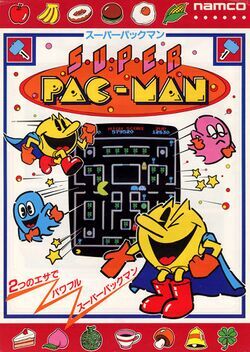 Namco had developed a worldwide success with Pac-Man. It was so successful that their US distributor, Bally Midway, could not wait for them to develop a sequel, and published their own, Ms. Pac-Man. Despite upsetting Namco in the process, Bally Midway was given the license to distribute Namco's official sequel to Pac-Man in the United States: Super Pac-Man, which was the first game from the company to use a Motorola M6809 microprocessor (in fact, it used two, and six others used this hardware setup). From an American stand point, Super Pac-Man was a bit of a let down. It altered the game play substantially enough to alienate many fans of the original game. From the Japanese perspective however, Super Pac-Man was a logical evolution of the game. One that does not repeat elemental game mechanics with small alterations, but rather one that takes the core characters and reinterprets their roles. The same is also said for Pac & Pal, which was only officially released in Japan. The goal of Super Pac-Man is similar to, but not the same as, the original Pac-Man. You must still clear an entire maze, this time of bonus targets and not nondescript pellets. The targets however, are locked away behind gates which can be opened when Pac-Man devours the proper key. Alternatively, there is a new power pellet, the Super Power Pellet, which grants Pac-Man the temporary ability to grow twice his normal size, fly over ghosts to avoid a collision, and eat through locked gates. Eating a regular energizer increases the duration of this Super power through to the end of the energizer's time limit. Pac-Man will begin to flash like the ghosts do when he is about to return to his original size. Super Pac-Man never gained the level of popularity that other sequels of Pac-Man enjoyed. Bally Midway earned more money from Pac-Man Plus, which was their official competition to the wave of Pac-Man bootlegging that was still running rampant at the time. Super Pac-Man did, however, see a small amount of home conversions, mostly for home computers (including the Atari 800 and the Commodore 64). It was contained on the Game Boy Color version of Ms. Pac-Man as bonus game, and has also appeared on a few of Namco's Namco Museum compilations. As with the original Pac-Man, there is no central story line. As the player, you'll simply have one goal: clear as many rounds and get as high of a score as possible before you run out of lives from forced ghost contact. The player controls Pac-Man around the new item-filled maze with the joystick. You must eat every item behind the locked gates, and must eat the keys in order to unlock the gates. You must avoid contact with the ghosts while they are their normal color and Pac-Man is normal-sized. If they catch you, Pac-Man will lose a life. If you eat an energizer, the ghosts will turn blue, and you will have the chance to eat them for bonus points until they return to their normal color. If you eat a super energizer, Pac-Man will become very large, capable of using super speed and capable of crashing through gates without key. The ghosts travel at half speed through the side escape tunnels, and beneath the ghost regenerator. They can also exhibit a "stutter" behavior. A star will sometimes appear below the ghost regenerator. Try to eat it when the pictures on both sides of it match for up to 5000 bonus points. In bonus rounds, Pac-Man remains super and must eat every item as quickly as possible before time runs out. There are no ghosts in these rounds.